You may think that the steps involved in selling a property are the same right across Australia - but there are steps, processes and costs that are specific to SA that you should be aware of. Here is our step by step guide for selling your property in SA. 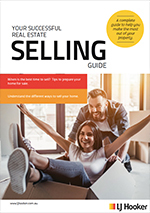 From how to choose an agent and the questions you should ask, to understanding the different ways you can sell and market your property to attract the most buyers, the costs of selling, what legally must be included in a contract, and the settlement process.